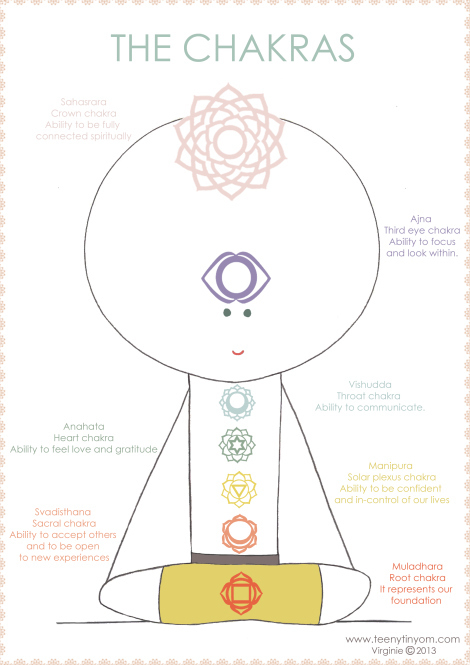 The chakras are the spiritual energy centres within the body. Each chakra relates to a certain colour and emotion, represented by a lotus flower and the number of petals on it. Sahasrara is the crown chakra, related to the colour violet. It represents our ability to be fully connected spiritually. Ajna is the third eye chakra, related to the colour purple. It represents our ability to focus and look within. Vishudda is the throat chakra, related to the colour blue. It represents our ability to communicate. Anahata is the heart chakra, related to the colour green. It represents our ability to feel love and gratitude. Manipura is the solar plexus chakra, related to the colour yellow. It represents our ability to be confident and in-control of our lives. Svadisthana is the sacral chakra, related to the colour orange.